Intraub, H., & Gagnier, K. M. (2018). Expanding Space: Does Imagination affect Boundary Extension for Visual Scenes? In T. L. Hubbard (Ed.). Spatial Biases in Perception and Cognition (193-208) . Cambridge, UK: Cambridge University Press. Intraub, H., Morelli, F., & Gagnier, K. M. (2015). Visual, Haptic and Bimodal Scene Perception: Evidence for a Unitary Representation. Cognition, 138, 132-137. Intraub, H. (2014). Visual scene representation: A spatial-cognitive perspective. In K. Kveraga & M. Bar (Eds. ), Scene vision: Making sense of what we see (pp. 5-26). Cambridge, MA: The MIT Press. Intraub (2010). Rethinking Scene Perception: A Multisource Model. In B. Ross (Ed), Psychology of Learning and Motivation, vol. 52 (pp. 231-264), Burlington: Academic Press. Dickinson, C. A., & Intraub, H. (2009). Spatial Asymmetries in Viewing and Remembering Scenes: Consequences of an Attentional Bias? Attention, Perception & Psychophysics, 71, 1251-1262. Michod, K. & Intraub, H. (2009). Boundary extension. Scholarpedia, 4(2):3324. Intraub, H. & Dickinson, C. A. (2008). False memory 1/20th of a second later: What the early onset of boundary extension reveals about perception. Psychological Science, 19, 1007- 1014. Intraub, H., Daniels, K. K., Horowitz, T.S., & Wolfe, J.M. (2008). Looking at scenes while searching for numbers: Dividing attention multiplies space, Perception & Psychophysics, 70, 1337-1349. Dickinson, C. A., & Intraub, H. (2008). Transsaccadic representation of layout: What is the time course of boundary extension? Journal of Experimental Psychology: Human Perception and Performance. 34, 543-555. Park, S., Intraub, H., Yi, D-J., Widders, D., & Chun, M. M. (2007). Beyond the Edges of a View: Boundary Extension in Human Scene-Selective Visual Cortex, Neuron, 54, 335- 342. Quinn, P. C., & Intraub, H. (2007). Perceiving “outside the box” occurs early in development: Evidence for boundary extension in 3- to 7-month-old infants. Child Development, 78, 324-334. Intraub, H., Hoffman, J.E., Wetherhold, C. J., Stoehs S. (2006). More than meets the eye: The effect of planned fixations on scene representation. Perception and Psychophysics, 5, 759-769. Daniels, K.K. & Intraub, H. (2006). The shape of a view: Are rectilinear views necessary to elicit boundary extension? Visual Cognition, 14, 129-149. Intraub, H. (2004). Anticipatory spatial representation in a deaf and blind observer, Cognition. 94, 19-37. Gottesman, C.V. & Intraub, H. (2003). Constraints on spatial extrapolation in the mental representation of scenes: View-boundaries versus object-boundaries, Visual Cognition, 10, 875 – 893. Intraub, H. (2002). Visual scene perception. In Nadel, L. (Ed.) Encyclopedia of Cognitive Science, 4, pp. 524 – 527. London: Nature Publishing Group. Intraub, H. (2002). Anticipatory spatial representation of natural scenes: momentum without movement? Visual Cognition, 9, 93-119. (Special Issue: Representational momentum: New findings, new directions). Intraub, H. (2001). Internalized constraints in the representation of spatial layout. Behavioral and Brain Sciences, 24:4, 677-678. Gottesman, C.V. & Intraub, H (1999). Wide-angle memory of close-up scenes: A demonstration of boundary extension. Behavioral Research Methods, Instruments and Computers, 31, 86-93. Previc, F. H., & Intraub, H. (1997). Vertical biases in scene memory, Neuropsychologia, 35,1513-1517. Intraub, H. (1997). The representation of Visual Scenes. Trends in the Cognitive Sciences, 1, 217-221. Bishop, P. J., and Intraub, H. (1996). Visual dissociation of digitized photographs. Behavior Research Methods, Instruments, & Computers, 28, 365-371. Intraub, H, & Berkowits, D. (1996). Beyond the edges of a picture. American Journal of Psychology, 109, 581-598. Intraub, H., Bender, R.S., & Mangels, J.A. (1992). Looking at pictures but remembering scenes. Journal of Experimental Psychology: Learning, Memory and Cognition, 18, 180-191. Intraub, H., and Hoffman, J.E. (1992). Remembering scenes that were never seen: Reading and visual memory. American Journal of Psychology, 105, 101-114. Intraub, H. (1992). Contextual factors in scene perception. In Chekaluk, E. & Llewellyn, K.R. (Eds. ), The Role of Eye Movements in Perceptual Processes. Elsevier Science Publishers B.V.: Holland. (Pgs. 45-72). Intraub, H. (1989). Illusory Conjunctions of forms, objects and scenes during rapid serial visual search. Journal of Experimental Psychology: Learning, Memory and Cognition, 15, 98- 109. Intraub, H. (1986). Visual dissociation of objects and forms: Integration errors in a very shortterm store. In The Eighth Annual Conference of the Cognitive Science Society (pgs. 676- 683), Erlbaum: NJ. Intraub, H. (1985). Visual dissociation: An illusory conjunction of pictures and forms. Journal of Experimental Psychology: Human Perception and Performance, 11, 431-442. Intraub, H., & Nicklos, S. (1985). Levels of processing and picture memory: The physical superiority effect. Journal of Experimental Psychology: Learning, Memory, and Cognition, 11, 284-298. Intraub, H. (1985). Conceptual masking of briefly glimpsed photographs. In R. Groner, G.W. McConkie & C. Menz (Eds. ), Eye Movements and Psychological Processes. North Holland Publishing Co.
Intraub, H. (1984). Conceptual masking: The effects of subsequent visual events on memory for pictures. 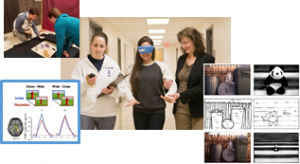 Journal of Experimental Psychology: Learning, Memory, and Cognition, l0, ll5-125. Intraub, H. (1981). Identification and processing of briefly glimpsed visual scenes. In D.F. Fisher, R.A. Monty, & J.W. Senders (Eds. ), Eye Movements: Cognition and Visual Perception. Hillsdale, N.J.: Lawrence Erlbaum Associates. Intraub, H. (1980). Presentation rate and the representation of briefly glimpsed pictures in memory. Journal of Experimental Psychology: Human Learning and Memory, 6, 1-12. Intraub, H. (1979). The role of implicit naming in pictorial encoding. Journal of Experimental Psychology: Human Learning and Memory, 5, 78-87.